"A chip cookie with a difference! 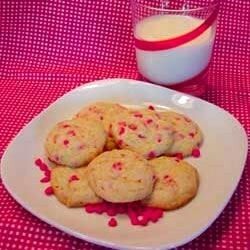 Light, crispy and eggless, these cookies are a great after-school treat with a cold mug of milk." Combine margarine, confectioner's sugar and vanilla. Beat until fluffy. Add flour, baking soda and oats. Mix well. Stir in cherry flavored chips (other flavors work well, too!). Drop by rounded teaspoonful onto ungreased cookie sheets and flatten slightly with fingers. Bake for 12 minutes. Remove immediately from cookie sheets and onto wire racks to cool. This is a very light cookie which does not spread as it bakes. Oatmeal and cherry chips are a very nice complement to each other. Very tasty! This cookie will only be as good as the quality of the chips you use. I found a good mini cherry chip from King Arthur Flour Catalog. My kids loved these.